Thought it appropriate, on Canada Day, to comment on two recently seen Canadian movies. While Canada sometimes has a reputation for making po-faced, off-beat dramas, these were both comedies. Brendan Gleeson, Gordon Pinsent, Taylor Kitsch. 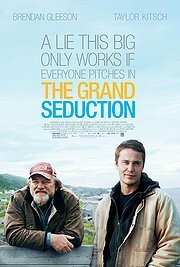 A small Newfoundland town’s bid for a new factory depends on their enticing a doctor to move to the community. She says: I loved the Québecois version of this movie and was curious to see how the English one would turn out. The setting was switched from Gaspé to Newfoundland here, which seemed a propos, and allowed them to hire almost the entire cast of 22 Minutes: Mark Critch, Cathy Jones, Mary Walsh. They’re all good, though, as is the lead, Irishman Brendan Gleeson and, of course, Mr. Gordon Pinsent, as he always. Liane Balaban’s part is almost too small to comment on, which is too bad. As for the doctor, it took me a few minutes to recognize him as having played the hunky Tim Riggins in Friday Night Lights. So that’s what happened to him, in case you were wondering! He’s probably not the strongest actor in this comic piece, but he’s just as hunky as ever. I enjoyed the new movie. Perhaps not as much as I enjoyed the original, but then, I knew certain jokes were coming this time. While I would have missed those jokes if they weren’t in this movie also, it’s hard to be quite as delighted the second time out. Fortunately, as is common with me, I did forget some details of the original plot, so wasn’t entirely certain how this one would play out. (Or if it played out differently than in the original, for that matter.) Always better to be caught up in the story. He says: I enjoyed that, too. It was funny, they did a good job adapting it. Tom Cavanagh, Mark Rendall, Jamie Spilchuk. In the midst of his marriage ending, teacher and bird enthusiast Ron Spencer loses out on a much-desired job as head of ornithology to Floyd Hawkins. He embarks on a revenge campaign with Ben, the young school janitor, who has his own reasons for disliking Hawkins. She says: Largely set at Point Pelee Park, featuring a main character who swears by saying “F” (literally, F), and a “villain” who is anything but, this movie flirts with the hokey. It is, undeniably, very funny at times, though, as Ron and Ben’s revenge schemes go terribly awry. And the acting, particularly by lead Tom Cavanagh, elevates the characters to more than cartoons. It’s light, it’s not terribly original, but you won’t hate yourself for watching it and laughing along. He says: It was pretty predictable, but it did keep my interest. A History of Violence – Cronenberg! Bon Cop, Bad Cop – This is a funny one! Categories: Movie reviews | Tags: Canadian arts, comedy, movies | Permalink. Has Brendan Gleeson ever delivered a bad performance or been in a horrible movie? I particularly liked him in _The Guard_. Well, I can’t think of any, but I have to be honest and admit I can’t think of any other movies he’s been in, period. Though I’m sure I’ve seen some, even though I haven’t seen The Guard. OK, Googled him — In Bruge! Loved that. Yes, very good in that. And the Harry Potter movies. Mad Eyed Moodie! OK.